You're receiving this newsletter because you visited the Tiare Films stand at a wedding show, or you signed-up at the Tiare Films website. Having trouble viewing this email? View it on the web. Welcome to the Tiare Films newsletter. A big 'hello' to all of the couples and exhibitors we met at the North City Wedding & Bridal Expo in January. In January the North City Wedding & Bridal Expo showcased the fantastic range of wedding services available in the Wellington Region. We were busy on the day - both meeting couples at our stand and filming the live video feed for the fashion show. If you watched the show you may also have seen some of our films projected on the big screen. Those highlight films can be seen on our website. The end of the day held a special surprise for us, as we were awarded the 'Digitex Supreme Exhibitor Site Award' for the Tiare Films stand - that's our blue stand above, top-right. We'd like to thank Justine's mum Janine for helping us man our stand at the expo. 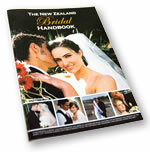 We next exhibit at the Wellington Wedding Show, Sun 2 May 2010, 10am-4:30pm, TSB Arena. Come and talk to us about your wedding plans. One of the best things about exhibiting is finding other great wedding services. In Porirua we met Robyn Carter from By Robbie who offers a contemporary (and lasting) take on the traditional wedding bouquet. 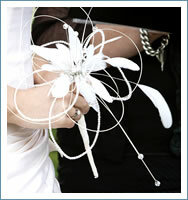 Robyn works with crystal stems and genuine Swarovski crystals in much the same way as cut flowers. Working solely with crystals, or a combination of cut flowers and crystal stems, these bouquets dance and shimmer as they catch the light. A bride with ceremonies in more than one country can carry the same bouquet, combine crystal stems with local seasonal flowers, or have their bouquet transformed into a stunning hairpiece. Pure crystal posies are also perfect for those with allergies. The By Robbie bridal collection also includes crystal hairpieces and hair threads, button-holes, wrist sprays and posies for flower girls. To view a selection of designs see the By Robbie website. In the months to come we'll be publishing a series of articles about wedding videography - in time for the 2010/2011 wedding season. The first is all about planning your reception and speeches - with videography in mind. Speeches and toasts are a chance to share stories, memorable moments from your lives, courtship and adventures as a couple. We cover: when to use a microphone; planning table layout, lighting and decorations; and public speaking techniques. 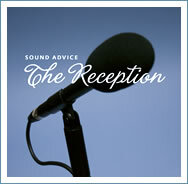 Read the article: Sound Advice: The Reception . Video still: Niki & Nick's wedding - Sunset at Coney Wines (Wairarapa). We've filmed all around the Wellington Region this summer - with weddings in the Manawatu and Wairarapa, Kapiti Coast, and closer to home in central Wellington. We'd like to congratulate the newly-weds; Amit & Fritzi, Fiona & Guss, Poppy & Jamie, Michelle & Todd, Fuailelagi & Sven, Niki & Nick, Jacqui & Teva, Sarah & Dean, and Grace & Jack. A wedding video is the best way to capture all the detail of a day to remember. To arrange a free wedding DVD consultation contact Justine Flanagan, +64 4 3800 800 / justine@tiarefilms.com. Pass it on - if you know someone planning a wedding, please forward them this newsletter.